By Myroslava Lesiv, IIASA Ecosystems Services and Management Program. The public can contribute considerably to science by filling the gaps of missing information in many research areas, for example, monitoring land use, biodiversity, or forest degradation. Crowdsourcing campaigns organized by research institutions bring together citizens interested in science and help solving research questions to the benefit of the whole world. 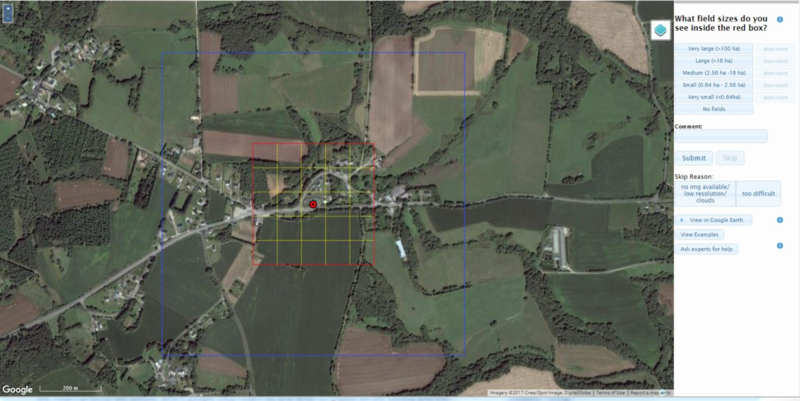 This June, the IIASA Geo-Wiki team ran the Global Field Size campaign, encouraging citizen scientists to classify field sizes on satellite images. Its aim was to develop a global field sizes dataset, which will be used as input to create an improved global cropland field size map for agricultural monitoring and food security assessments. The field sizes dataset can also help us determine what types of satellite data are needed for agricultural monitoring in different parts of the world. Geo-Wiki interface for collecting field size data. Background layer: Google Maps. Why are field sizes so important? They provide us with valuable information to tackle challenges of food security. A recent study showed that more than a half the food calories produced globally comes from smallholder farmers, who often make up the most vulnerable parts of population, living in poverty. Within this scope, the field size dataset fills the gaps of missing information, especially for countries that have a limited food supply and lack a well-developed agricultural monitoring system. The Global Field Size campaign has been one of the most successful crowdsourcing campaigns run through the Geo-Wiki engagement platform. Within one month, 130 participants completed 390,000 tasks – that is, they classified the field sizes in 130,000 locations around the globe! So we can see that crowdsourcing is powerful, but can we trust the data? Is it accurate enough to be used in different applications? I think it is! The Geo-Wiki team has significant experience in running crowdsourcing campaigns; one of the key lessons we have learned from previous Geo-Wiki campaigns is the importance of training the public to increase the quality of the crowdsourced data. This campaign was designed so that the participants learned over time how to delineate fields in different regions of the world, and, at the same time, pay special attention to the quality of their submissions. At the end of the campaign, the majority of participants gave us a feedback that, to them, this campaign was indeed a learning exercise. From our end, I have to add, this was also a challenging campaign, as fields are so diverse in shape, continuity of coverage, crop type, irrigation, etc. Global distribution of dominant field sizes. Cartography by Myroslava Lesiv. Country boundaries: GAUL. Software: ArcMap 10.1. During the campaign, the crowd was asked to identify whether there were fields in a certain location, and determine the relevant field sizes by the visual interpretation of very high-resolution Google and Bing imagery. A “field” was defined as an agricultural area that included annual or perennial croplands, fallow, shifting cultivation, pastures or hayfields. The collected data can also be used to identify areas falsely mapped as cropland. Now the team is focused on summarizing the results of the campaign, processing the collected field size data, and preparing them for scientific publication. We will ensure that the published dataset is of high quality and can be used by others with confidence!